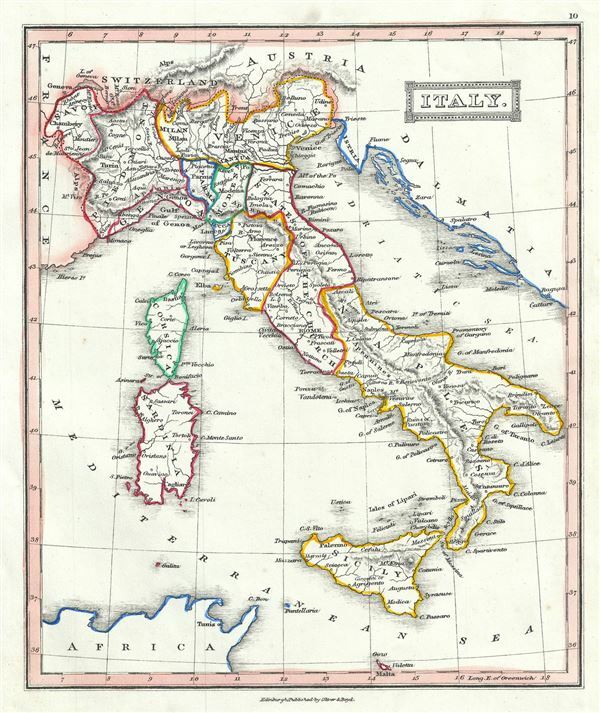 This is an attractive 1845 map of Italy by Thomas Ewing. It covers the pre-Garibaldi Italy split into numerous small duchies and states from Venetian Lombardy south to Sicily and Malta. Also includes the islands of Sardinia and Corsica. The map is color coded according to duchies, with relief shown by hachures. Cities, towns, rivers, mountains and other topographical features are noted. At this time in history, the peninsula was undergoing Risorgimento, Italy's march toward national solidarity. Revolutionary sentiments favoring the unification of Italy were gaining popularity under Giuseppe Garibaldi, paving the way to Italian solidarity. This period thus witnessed the birth of the 'La Giovine Italia' Italian solidarity movement. In 1830, a series of insurrections throughout Italy lead to the adoption of theÂ TricoloreÂ and nearly established a united Italian state. Unfortunately, in 1831, Pope Gregory XVI invited the Austrian army to help crush the insurrections, postponing the push for Italian solidarity until the Revolutions of 1848.